This day of my travel was sponsored by clouds, blue houses and escape from the rain that didn’t eventually rain. After such a long break in Cracow it was a bit difficult to ride again. The first 20 K were not the easiest. Additionally it was quite chilly, sprinkled a bit and I was stressed it was going to suddenly pour down. And becasue I caught cold 10 days ago and still couldn’t find it, I didn’t want to get even sicker. I was really happy about the meeting with the kids from Siemacha the evening before, where I had a chance to talk about my travel and answer their looooots of questions! 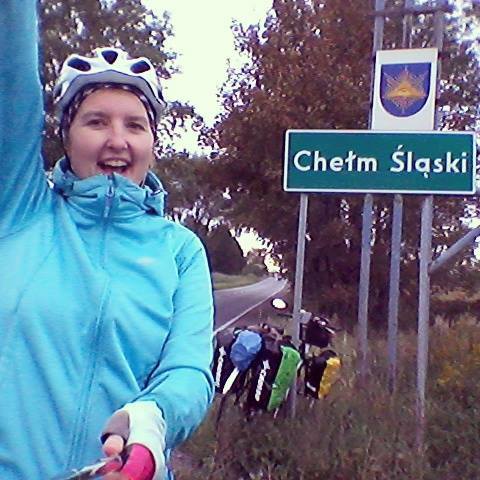 gave me so so so much energy that it was much easier to cycle the next day! 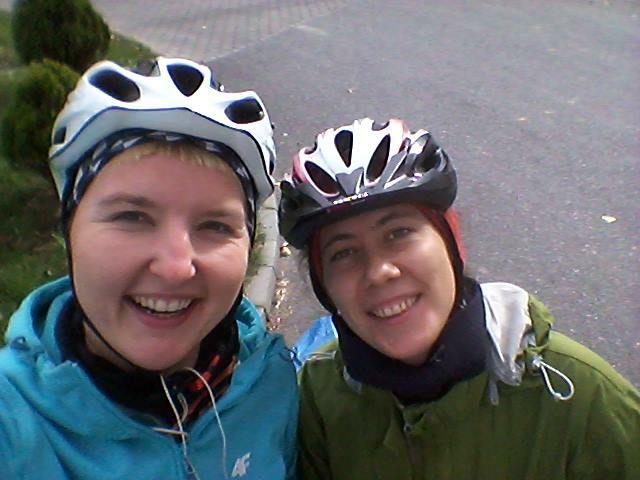 I was happy about the first 20 K with Kasia, who took a day off to cycle with me! And despite the fact that it was not the most pleasant ride ever I think it will be quite cool to remember our break at the gas station, when the guys from the service didn’t want to believe my route (quote: “whaaaaat?”) and where Kasia has gifted me with ropes that are one of the most important parts of my bike right now. Thank you, Kasia! Blue houses sponsored the day! I was the most happy when I saw the sign “Silesia” and I knew it was over for today! Such was the day 16 of my travel with 621 Km done altogether (and I think I will start taking photos every day with the number of kilometres done – what do you think? ).